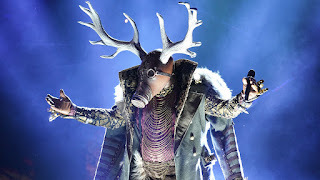 I'm going to admit, I'm obsessed with The Masked Singer. Its ridiculous and the dumbest thing I've ever seen, but I can't help but watch it and try to figure out who the singers are. I've decided to share some of my predictions on a few of the singers that I actually have an opinion on. Some of the singers I have no idea yet. If you haven't seen the latest episode of the Masked Singer, stop reading now. There is a spoiler coming up of someone who was unmasked. 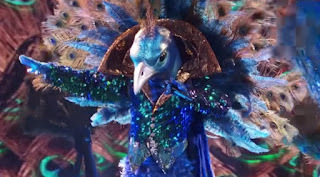 The Peacock - I'm thinking this is McCauley Culkin. His first performance he had mentioned that he was friends with Michael Jackson and I know Culkin can sing, I googled him. He made it sound like he was performing/acting from a very young age and that he did some dramas. So McCauley Culkin is my guess for Peacock. 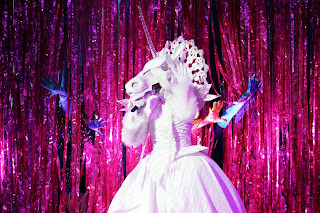 The Unicorn - Something that the Unicorn had said during her second performance about losing her Sheen made me think immediately Denise Richards. I know the judges were also throwing that out there, but then they veered off in a different direction. I'm holding steady with Denise Richards. The Deer - I just wanted to say that I was totally wrong about who this was. I was writing this prediction as I was watching the latest episode, so of course I thought it was Payton Manning. The clues in the second performance made me think that he is good at throwing things (quarterback) he's done some television commercials (nationwide commercial) and the twang in his voice when he sang was a good indication of Payton Manning... but it wasn't... It was Terry Bradshaw. I should have known by the way he walked down the stairs. Makes sense now, but I was close and I wasn't the only one. The Bee - I am 95% certain this is Tina Turner. The voice and the body language really gave it away. Even the clue of her starting her carrier in the 50's, the dance moves screamed Tina. It just makes sense. I hope I'm not wrong, that would be embarrassing. These are my predictions. Who are you rooting for and who's under the mask. Leave your comments below.